Synopsis: With the intrigue of Memento and the romance of The Time-Traveller's Wife, Forgotten is the perfect YA novel. Here's the thing about me: I can see the future in flashes, like memories. But my past is a blank. I remember what I'll wear tomorrow, and an argument that won't happen until this afternoon. But I don't know what I ate for dinner last night. I get by with the help of notes, my mom and my best friend Jamie, and the system works ...Until now. Everything's falling apart. Jamie's going of the rails. My mom is lying to me. And I can't see the boy I adore in my future. But today, I love him. And I never want to forget how much ...Forgotten is the story of a girl for whom yesterday is lost, today is an adventure, and tomorrow is a memory. An unforgettable read. I started this book thinking what an interesting idea Cat Patrick had stumbled across. I finished it thinking what an amazing debut novel Forgotten is. Once you can get past the fact that the main character is called London (who in their right mind would call their child London? I think we can pull the ‘crazy Americans’ card here…! ), Forgotten is a fantastic, absorbing debut novel that will have you reading in every spare second you have (and I mean it!). The concept is an intriguing one- knowing your future but forgetting your past- and initially, this was what made me read Forgotten. I’m not a particular fan of chick-lit (though I do love a good romance), and the mystery of London Lane’s condition is what made want me read Forgotten. All I can say is that it was worth it – a million times over. 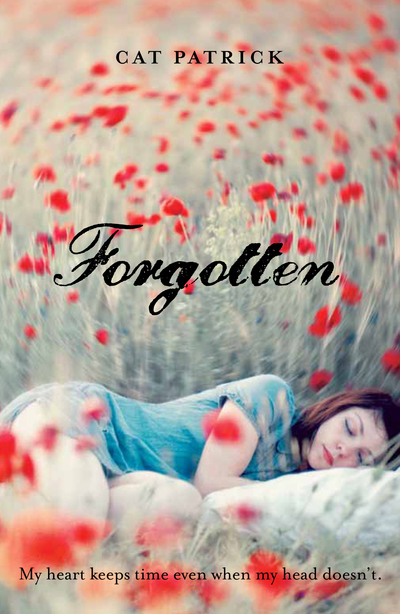 Forgotten is one of those books you take with you everywhere, just incase you really DO have a spare moment. And when you do, you devour the pages with a speed you never knew you were capable of. One of the funnier things about my reading experience with Forgotten is that I may have, slightly, just a teeny bit, fallen in love with the male love interest. Now, considering that I class myself as a mostly heterosexual guy, that’s some pretty good darn work on Cat Patrick’s side for selling London’s boyfriend to the reader so well. Sure, sometimes he might have been a bit too perfect, but I can guarantee he will have you gushing over how sweet he is in one way or another! All the characters are believable, and it is very easy to connect with both London, her mum, her best friend and her boyfriend. Some people have complained that the ending is too soon, and that many of the questions raised during Forgotten are left unanswered. This is very true and also incredibly appropriate. People come to expect ‘happy’ endings from novels, and sometimes I wish they didn’t. Leaving the ending so open not only allows everyone to create their own ending, but is also very realistic: not all conditions can be cured. Thousands of people live with different diseases, having long given up hope of a cure. Why should it be different for London in Forgotten? While London’s condition isn’t always clearly explained, and some things take working out (after which you think, ‘oh, how obvious!’), Forgotten is a gripping new novel that will leave you gasping for more (partly due to the fact that it ends with very few answers to the questions raised. As much as I like the ending, Cat Patrick better be at work on book 2!) What starts as almost-normal coming-of-age drama soon twists into a psychological thriller/drama as London unravels her past in what becomes a truly thrilling and unpredictable novel. Forgotten is one of the best reads of 2011 so far. What did you think about Forgotten? Oooooo. I’m intrigued. I shall keep an eye open for this one! I’ve not seen it in my blogging travels so thanks for sharing!